Development of an augmentative and alternative communication (AAC) device for people who can't talk or see. An android phone running the SWAN app says the alphabet, the user selects letters to form a sentence. Selection can be done using any AAC switch, via SWAN's electromagnetic interface. Selection is also possible using only the phone's internal sensors, including sip & puff capability. SWAN is completely open source, the app will be free. 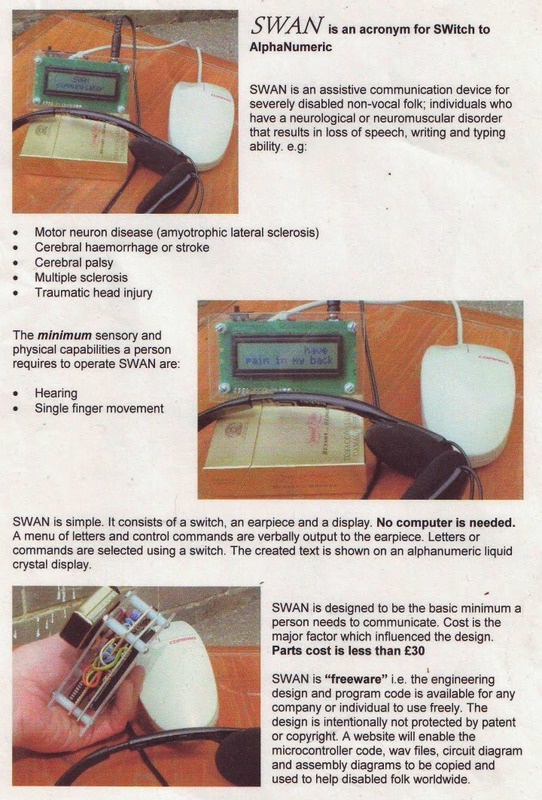 My first attempt to produce a SWAN device was in 2001, using a microcontroller. My sister bought me PICBASIC software, I made a PIC programmer, a friend got me a handful of PIC 16F84 microcontroller chips, and I began to develop SWAN. The prototype used a modified computer mouse as an ergonomic switch - the mouse button switches being simply connected to the cord, no use being made of the internal electronics. A PIC 16F84 microcontroller was interfaced with an ISD 1016A "chipcorder" IC. This device, an addressable non-volatile audio record/playback chip, had my voice saying the alphabet recorded on it. The microcontroller then sequenced through the alphabet, and the user could hear this through the headphones. Letters were selected using the mouse buttons, and the created text was shown on an HD 44780 liquid crystal alphanumeric display, having two lines of 16 characters. The project stalled and was shelved. I'd contacted some people in the field of communications for the disabled, unfortunately they didn't like the fact that I wanted SWAN to be "freeware" - they wouldn't commit to further development and manufacture without sole ownership of the intellectual property rights. I got pissed off, especially since I was giving the design to them for nothing. End of SWAN...... Until 13 years later, I was given a smartphone, and the concept became do-able with minimal hardware cost, and a free "app".